Is the North Manchester Center for History Open? YES! It may not look like it, but the North Manchester Center for History is open again after its annual 3-month winter hiatus. Casual observers may be forgiven for thinking that the Center is boarded up and temporarily out of business. But the Center is most definitely open! Visitors are protected by a covered walkway and can still access the Center for History through the front door from 10 a.m. to 4 p.m. weekdays. In the rare event that construction temporarily blocks the front entrance, visitors are welcome to access the museum through a door in the alley on the west side of the building. Staff and volunteers are on hand as always for those who wish to visit the museum, drop off articles to add to the collection, be assisted with research for the Family Tree Bicentennial Project, or do other research. SRKM Architects and D-T Construction will be able to duplicate the windows, terra cotta and limestone details, and brickwork of the original. After months of planning, most of the custom materials have been ordered. Work will gather speed as the weather permits; completion by the end of June is anticipated. 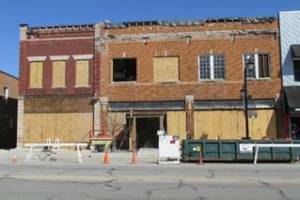 The Center for History is a strong advocate for historic preservation, and very happy to participate in the improvements that have taken place the past three years downtown. As a private not-for-profit that receives no regular government funding, the Center is fortunate to be able to participate in the town’s façade project; however, that assistance will cover less than 10% of the cost. As a fund raiser, the Center is offering a limited number of engraved pavers that will be placed along the front of the new façade. Contact the Center for more information. The Center for History is open at 122 E. Main Street Monday through Friday from 10 to 4. Call the Center at 260-982-0672, or e-mail us at nmhistory@cinergrymetro.net.